Bem-vindo à Riviera des Chutes cabine de Lapine na floresta. Este retiro de 1400 + pés quadrados com 500 pés de plataformas é o perfeito o ano todo get-away. Localizado na pequena Deschutes River, que apresenta todo o interior de madeira com enormes janelas da catedral se abrem para o prado arborizado, deck churrasqueira e banheira de hidromassagem. Privacidade é a palavra operativa aqui. Relaxar, desfrutar e relaxar no silêncio de este belo Central Oregon A-Frame. O clima é seco, com neve no inverno e um monte de céu azul durante todo o verão. Ano em torno de temperatura à noite é fria, mesmo nos dias mais quentes de verão. Mt. Bachelor, premier área de esqui de Oregon fica a uma hora de carro, e a floresta nacional de Deschutes oferece atividades ao ar livre maravilhosas, incluindo golfe, pesca, caiaque, caminhada, esqui, snowmobile, canoagem e rafting. A área é pontilhada com lagos e rodeado por pontos de interesse geológico, incluindo Fort Rock e Newberry Crater, um dos vulcões mais recentes dentro do Estados Unidos contíguos, com cones de cinzas, lava torcida, e um ano-em torno de cavernas de gelo. A vizinha Big Deschutes é considerado um dos melhores rios de pesca e de lazer da nação. Cozy cabin- prefect for relaxation. Family of 5 and 2 medium sized dogs all had a wonderful stay. We spent several nights at the A Frame and truly want to come back. Kitchen is full of utensils and items for any cooking, grilling or baking. I loved how many towels were stocked and extra blankets. Blankets for the dogs was a bonus as well. Clean, beautiful and comfortable. I would definitely recommend staying here. Thank you. We loved it here! 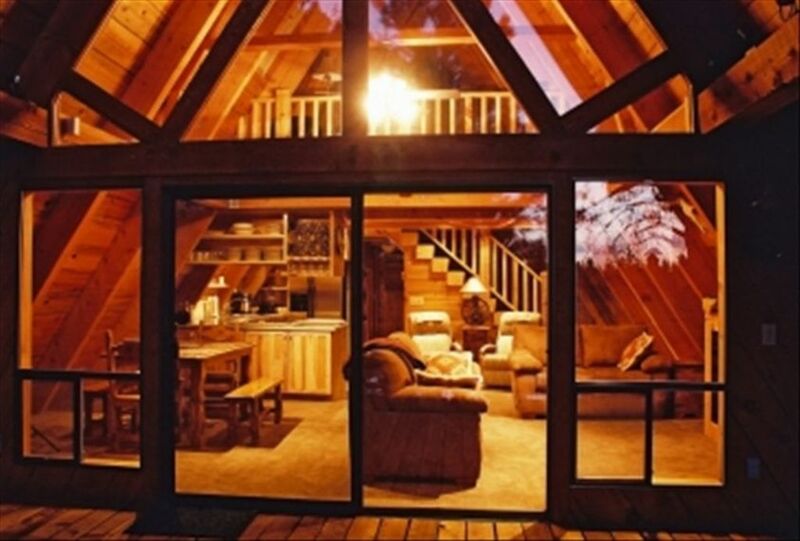 This beautiful A- frame cabin has everything you need while you are away from home. The home was clean upon arrival and the jacuzzi is new and very nice, especially when we are surrounded by snow. This is the 2nd winter vacation spent in this cabin in La Pine, OR and we will definitely be coming again. Thank you Lauren for accommodating us so well everytime :). We loved our stay at this sweet cabin. It was perfect for our family of 4. We loved how it was accessible to town but also felt private and remote with a view of woods out the back window. And they were very nice about allowing us to check out a bit late when snow fell on the last morning we were there and our kids wanted to play in the snow. Thank you so much for sharing this spot - we'll be back! My family decided to meet up for Christmas and i cannot stress enough how PERFECT of a place this is. The cabin itself is cozy and filled with everything you would need - even down to dog blankets (which was great since we had 3 dogs!). The property itself was amazing as well. We were lucky to get a great snowfall on Christmas eve and enjoyed sitting in the hot tub whilst the puffy snowflakes fell. There is a river a short walk from the cabin and it is great to walk the pups down. There is also a flat area in the back great for fetch or casual snow play. I had a few questions for the host before arriving and they were very fast and detailed in their responses. Honestly, perfect stay. We are even talking about doing another holiday there! We loved our stay in this cabin and the beautiful surrounding area! The cabin is SUPER clean and has all the necessary amenities, including plenty of kitchen items to cook in the cabin. We really enjoyed coming back to a warm and cozy place to relax after our days out in the snow.